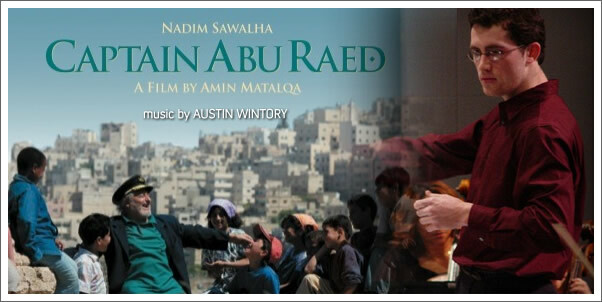 For Captain Abu Raed, Austin Wintory wanted the score to have a universal appeal. He achieved that by balancing traditional Arabic instruments, such as kanun and tablas, with a rich orchestral palette and Western instruments like sleigh bells and castanets. He recorded with the Hollywood Studio Symphony and world-renowned vocalist Lisbeth Scott (Passion of the Christ, The Chronicles of Narnia). In addition to earning the “Best New Film Composer” award, Wintory’s score has been recognized as an Oscar contender by the Los Angeles Times. Austin Wintory’s love of film scores began at the age of ten in Denver, Colo., when he first listened to Jerry Goldsmith’s classic scores for Patton and A Patch of Blue. In high school, he taught himself to compose, orchestrate and conduct, before studying at both New York University and the University of Southern California. Wintory, at the young age of 26, has received accolades for his scores to feature films, short films and videogames, including fl0w, for which he received a BAFTA nomination. He has several upcoming film projects, including the comedy Knuckle Dragger, holiday film Make the Yuletide Gay and dark drama The Sunset Sky. Captain Abu Raed tells the story of a lonely airport janitor (Nadim Sawalha) whose life changes after he finds a discarded captain’s hat at work and wears it home. When the poor neighborhood children assume he is a real pilot, he forms a friendship with them by weaving fictional stories about the world outside of Amman, Jordan, based on books he has read. As he attempts to make a difference in their lives, Abu Raed faces attacks from Murad (Hussein Al-Sous), a young boy who calls him a liar, and develops a relationship with Nour (Rana Sultan), a real female pilot with troubles of her own. Captain Abu Raed is a story of dreams, friendship, forgiveness, and sacrifice.